Somewhere, Cookie Monster is sobbing. 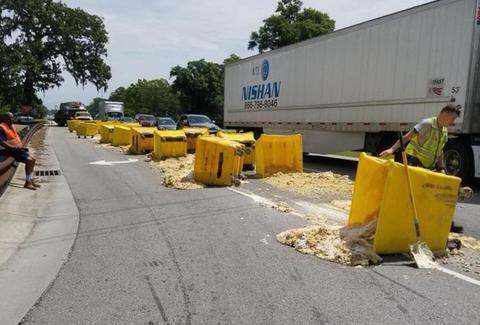 A truck carrying 20 giant rolling carts of cookie dough spilled its cargo all over a highway in North Carolina on Tuesday, dumping tons of perfectly good would-be sweet treats onto the road and stranding drivers behind what was essentially one big, soggy cookie cake. The messy incident occurred at the intersection of Highway 17 and Sidbury Road just outside Wilmington, North Carolina, when the truck's back door randomly opened and dropped 20 carts filled with raw cookie dough onto the road. Officials suspect the back door swung open when the truck driver accelerated after the traffic light turned green. In a photo posted to the official Pender EMS & Fire Facebook page, you can see a man attempting to clean up the scene with a shovel, though the accident still caused quite a traffic build-up in the area through lunchtime. More importantly, though, it ruined some perfectly good cookie dough. According to some comments on the Pender EMS & Fire Facebook post, it's very likely that the cookie dough wasn't actually meant for human consumption, but rather was a screwed up batch from a nearby factory that was sold off to farmers to feed cattle or pigs. That would actually be a bit reassuring, because the big vats of dough didn't appear to be covered at all (or all that sanitary for that matter), judging by the way they just rolled out and tumbled over. Still, it's a shame this is how all that cookie dough had to go, especially just days after that 12 tons of liquid chocolate spilled out onto that highway in Poland.